June 25, 2018,, Taipei, Taiwan – BIOSTAR unveils its newest solid-state drive featuring 3D TLC NAND flash – the M500 M.2 PCIe NVMe SSD. The BIOSTAR M500 uses the compact M.2 2280 form factor that is compatible with latest-generation motherboards, laptops, and mini PCs. It supports the ultra-speed PCI-express Gen3x2 interface which offers builders greater compatibility. 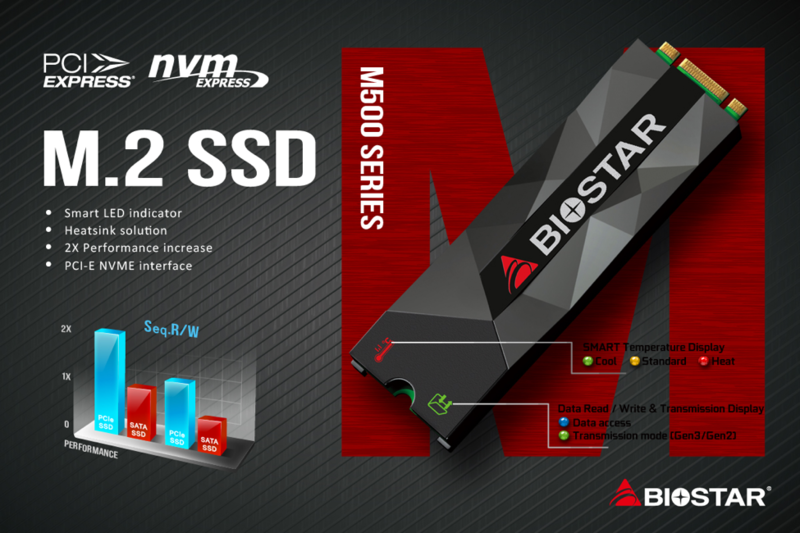 The BIOSTAR M500 SSD is NVMe (Non-Volatile Memory Express) 1.2 compliant delivering high-performance speeds of up to 1700MB/s sequential read and 1100MB/s sequential write and random read/write IOPS of up to 200K/180K. 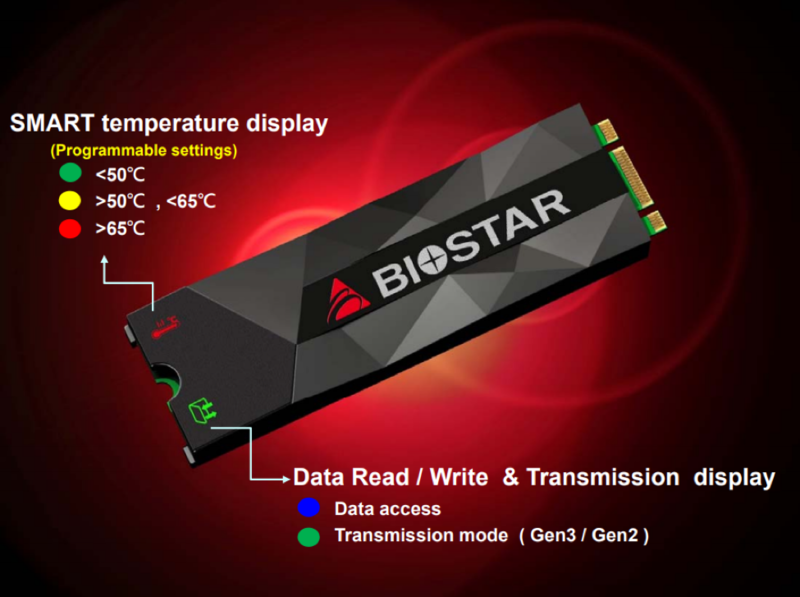 The BIOSTAR M500 Series SSD features visible smart LED indicators on its heatsink cover for temperature and data activity. The LED Smart Temperature display delivers real-time temperature status of the solid-state drive in three different levels: green for temperature below 50°C, yellow for temperature between 50°C to 65°C, and red for temperature above 65°C. The LED Data Transmission display data transmission status: blue light for access status and a green light for PCIe transmission mode (Gen 2 / Gen 3). The BIOSTAR M500 M.2 PCIe SSD sports a diamond-shape heatsink design that delivers efficient cooling to sustain performance and avoid thermal throttling. The heatsink also gives the M500 an edgy gaming look that’s perfect for any gaming motherboard. The BIOSTAR M500 Series M.2 SSDs features low power consumption with read mode requiring only around 1.7 W for the 256GB model. The low power consumption helps extend the battery life of notebooks and ultrabooks making it the perfect storage upgrade for portable PCs.